The newest Alaska Lounge opened at the end of Concourse C at Sea-Tac Airport today, and my wife just happened to be passing through on her way to meet me in San Francisco. This review is based on her photos and commentary. Don’t you love that blue accent light?! I have not seen hours posted for this lounge on the Alaska Airlines website, but based on the hours of the other two Sea-Tac locations I expect it to be open daily from 5 AM to midnight. Membership rates start as low as $295 per year (based on status) and include access to a variety of other partner lounges, including American Airlines Admirals Clubs. You can also pay for a day pass for $45. The lounge is evidence of a decisive shift in Alaska’s creative style. This actually started in January 2016 when the new livery was unveiled, though it may have accelerated after the purchase of Virgin America later that year. The location upstairs near gates C9-C17 should offer an excellent view of the runway from these big windows. Some signs of the design shift were already evident in the temporary lounge that Alaska opened in the Sea-Tac North Satellite, which may have been intended to test some concepts such as the water wall and more angular shapes. (The North Satellite location will get its own overhaul when a permanent lounge is built as part of project North STAR.) Other features, like the Dale Chihuly painting in the front reception, are common to the other Alaska Lounges. 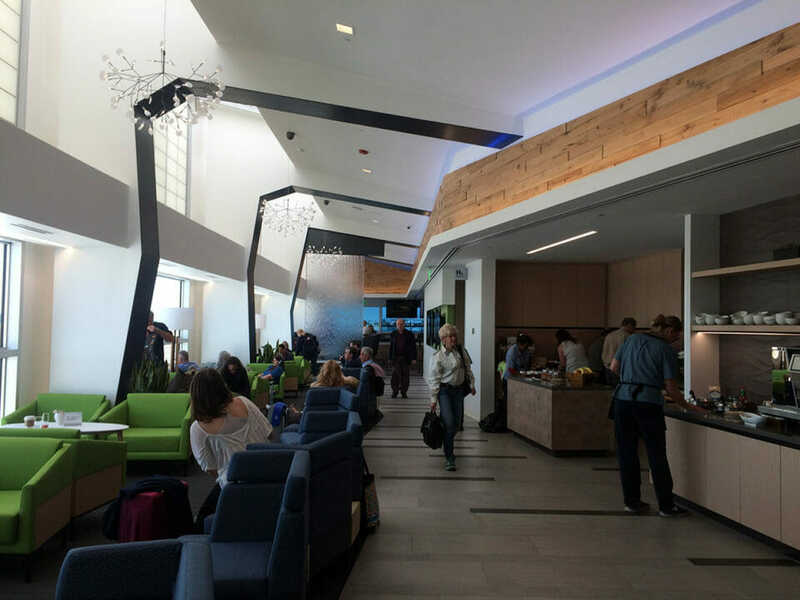 Vivid blue and green tones have replaced the traditional Pacific Northwest lodge style, and the various seating areas and lighting fixtures look much more contemporary. I can’t say that I prefer it (there was something homey about the old décor), but it probably is a necessary change as Alaska expands its reach to new markets. For example, I’ve heard some people complain about the LAX lounge looking dated even though it was recently renovated. In case you didn’t know, similar artistic changes are expected to roll out across the fleet in a variety of forms. One example is the new bulkhead that uses abstract curving shapes instead of the current native Alaskan-inspired carpet. But let’s get back to the lounge. Amenities are expected to be comparable to the rest of the Alaska Lounge network. These includes light snacks; an on-demand pancake machine; and complimentary beer, wine, and cocktails with a strict no-tipping policy. Additional premium wines and spirits are available for purchase. (I personally stick to beer and wine in the lounge, where the selection is better, and switch to cocktails in the air, where the mini liquors are a notch above the well selection.) Megan was able to enjoy a complimentary glass of sparkling wine before leaving to catch her flight on Virgin America. My wife reported she was able to access the lounge easily using the Priority Pass membership with her American Express Platinum Card. I think that’s a good sign the new lounge is increasing capacity at the airport. Remember also that not all lounges limit access all the time. It should be easy to get to this lounge from the main concourse or the North Satellite if either of the other locations are full.